Ardell Professional Studio Effects #105 Lashes has taken a makeup artist favorite and lash wearer trick, custom stacking, and done the work for the wearer. Provides the ultimate professional look! This already dramatic lash style has been doubled to create the ultimate glamourous lash FX studio look. SFX #105 false lashes really bring out and emphasize the entire lash line to create the utimate eye opening drama! These pro-designed layered false lashes are reworked to provide the ultimate professional look for eye opening studio effect you long for! Ardell Professional Studio Effects #110 Lashes has taken a makeup artist favorite and lash wearer trick, custom stacking, and done the work for the wearer. Provides the ultimate professional look! This favorite everyday Natural lash style has been double stacked to create a glamourous yet natural studio FX look. SFX #110 false lashes bring out and emphasize the entire lash line to create the utimate eye opening drama! 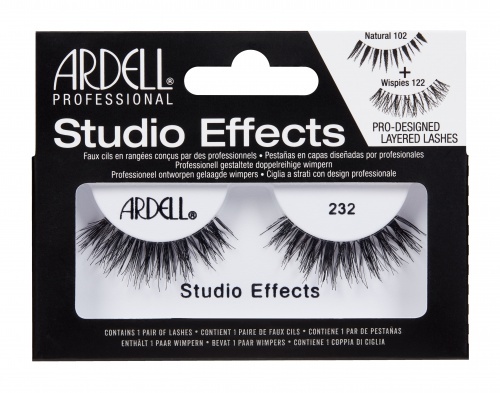 Ardell Professional Studio Effects #230 Lashes has taken a makeup artist favorite and lash wearer trick, custom stacking, and done the work for the wearer. Provides the ultimate professional look! SFX #230 false lashes bring out and emphasize the entire lash line to create the utimate eye opening drama! Ardell Professional Studio Effects #231 Lashes has taken a makeup artist favorite and lash wearer trick, custom stacking, and done the work for the wearer. Provides the ultimate professional look! SFX #231 false lashes bring out and emphasize the entire lash line to create the utimate eye opening drama! 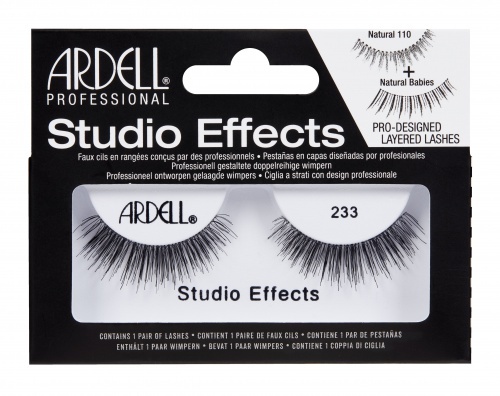 Ardell Professional Studio Effects #232 Lashes has taken a makeup artist favorite and lash wearer trick, custom stacking, and done the work for the wearer. Provides the ultimate professional look! SFX #232 false lashes bring out and emphasize the entire lash line to create the utimate eye opening drama! Ardell Professional Studio Effects #233 Lashes has taken a makeup artist favorite and lash wearer trick, custom stacking, and done the work for the wearer. Provides the ultimate professional look! SFX #233 false lashes bring out and emphasize the entire lash line to create the utimate eye opening drama! 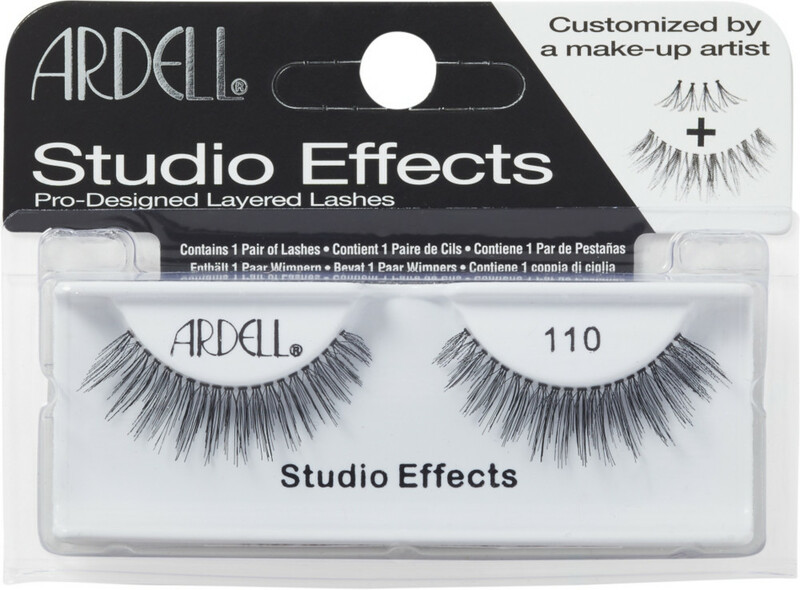 Ardell Studio Effects Custom Layered Lashes, 16 Piece Display (65340) contains 16 pairs of pro-designed studio effect false lashes in a attractive retail display. 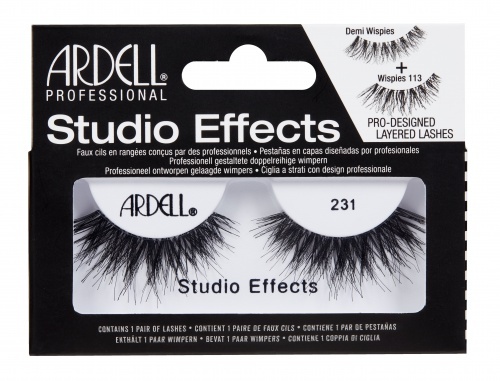 Ardell Professional Studio Effects Lashes has taken a makeup artist favorite and lash wearer trick, custom stacking, and done the work for the wearer. These lushly layered false lashes are reworked to provide the ultimate professional look for eye opening studio effect you long for! Wispies: Volumized the center of the lash by stacking individuals for a big eye effect. Demi Wispies: Added flared individuals to enhance the wing tip effect, creating a sultry look. 105 Lash: Doubled the lash to add the drama to create ultimate eye drama. 110 Lash: Doubled one of our most popular lash styles for an eye opening effect. Ardell Professional Studio Effects Demi Wispies has taken a makeup artist favorite and lash wearer trick, stacking, and done the work for the wearer. Provides the ultimate professional look! 4 flared individuals lash clusters have been placed at the outer corner of the lash band for a dramatic flare to touch of sophistication and glam. SFX Demi Wispies really bring out and emphasize the outer flare for a grand full on glamour! 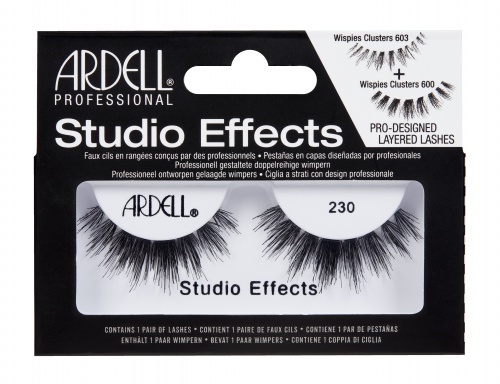 Ardell Professional Studio Effects Wispies has taken a makeup artist favorite and lash wearer trick, stacking, and done the work for the wearer. Provides the ultimate professional look! 4 flared Wispies individuals lash clusters have been placed in the center of the lash band for added glam and volume to really bring out and emphasize the middle of the lash for a grand full front end effect!